I've been trying to find a site that has a comparison of all the main UK apps available for each of the main streaming devices, but strangely can't find a single one. I've chucked them into a spreadsheet - can anyone confirm if my list is correct, and if the few question marks are correct? Last edited by Stevie G; 21-06-2016 at 13:46. FireTV has My5 which is the updated/replacement for Demand 5. Ah, thanks, I've corrected that, and looks like it's available for Apple TV too.... although Channel 5 is even worse than IdiotTV so not sure why I bothered listing it! So Amazon's streamers are the most complete, missing just Now TV? Whatever happened with the Apple pay TV channels that was rumoured around the time of the new Apple TV release? Last edited by Stevie G; 26-05-2016 at 16:10. The Shield really is **** poor for Apps so much for Android TV. Yeah, it's frustrating. It's excellent for Kodi, so quick and responsive, but the lack of other UK apps really holds it back. ITV Player on FireTV DOESN'T contain all of their content due to licensing restrictions - there are specific things that they're not allowed on there. I also find some of the non-Amazon apps sometimes drop frames, stutter and don't see that on any other box. Roku has the Google Movies and TV service - worth considering that. I assume the Shield has that too. The NowTV boxes do allow Plex to be sideloaded in developer mode. There is no one box that does everything - I would suggest unless you NEED Kodi, the Roku is probably the best all-rounder other than the fact that there's no 4K option in the UK. 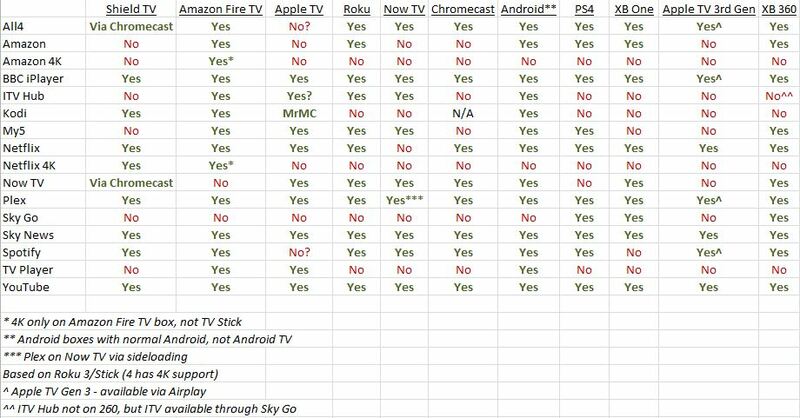 How does Chromecast compare to the list above? From memory Chromecast supports Netflix, BBC iPlayer, and plex but I don't think much else. Certainly not now tv, ITV hub or Amazon prime. Apparently bt support does but I've not tried it to confirm. Tv player doesn't either, although To View (similar to tv player with freeview channels but a lot less channels) does. Last edited by Stevie G; 28-05-2016 at 16:22. Is there any advantage in using a chromecast? Chromecast DOES support Now TV, All 4, YouTube and Disney Life. Amazon have been difficult as it competes with the Fire TV stick. Chromecast does get a fair amount of use in our house. Is it worth including generic Android set-top boxes? They're not quite as polished but with access to the Play store there are generally a lot of apps available that work well. Just stock Android isn't ideal for use on non-touch screens. I've got a Beelink MiniMXIII on its way to me in the next week or so. I've currently got a Celeron NUC running LibreELEC but I was just really curious about what these things can do for 30 quid. Looks like it has some kind of launcher that works with a remote. I've got the Mini M8S, which is has less memory than your new one. I'm sure the interface etc will be the same as mine so it will have a remote and you can have a row of frequently used apps at the bottom of the screen in quick launch, while the others are stored in different menus. You've got access to the play store so you should be able to install plenty apps from there. It will have Kodi installed with a bunch of addons however I cleared them and just did a fresh install with the ones I wanted. I also picked up a wireless mini keyboard for it and it is worth doing that as typing with the remote is slow and having the keyboard popping up on screen takes up quite a chunk of space. It's a great bit of kit for the price. Sounds cool. Yeah I'm not sure I'd trust all those preinstalled addons. They're probably spying on my or stealing my credit card. I think I'll try and get it as fresh as possible when I get it. Yes, sure, I can add stock Android tv to the list as well if someone can tell me which apps are available on it? Do you mean android tv, or are there boxes that have just android as well? Standard Android - not Android TV - so doesn't have the limited selection of apps. Wish Google could come up with a way of making Android TV just be Android with a remote-compatible interface instead of a new OS with its own apps - would be an amazing STB solution then. Is it still the case that the majority of generic android boxes can only deliver Netflix in SD? I know when I was checking some of them out a while ago this was the case, as Netflix identifies them as mobile devices and limits the stream quality. Yeah most of the android boxes will only do Netflix in SD, however they will run Kodi.